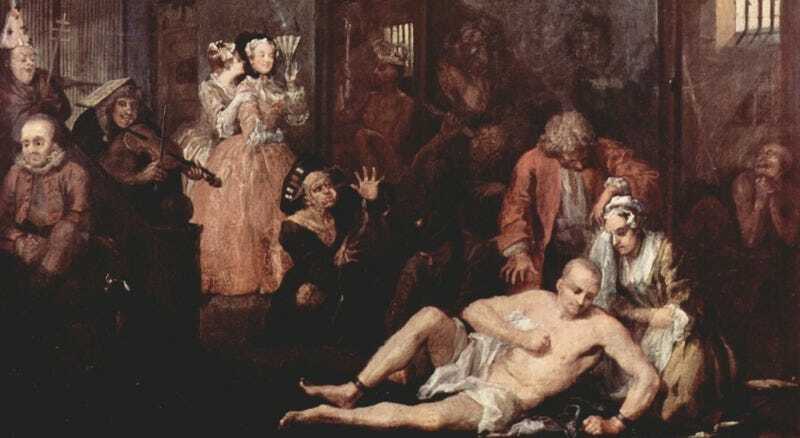 Bethlem Royal Hospital (“Bedlam”) as depicted in a scene from William Hogarth’s series, “The Rake’s Progress” (1735). Public domain. “How dare you treat me this way!” boomed a husky voice with a thick Eastern European accent. “I’m king of the Puerto Ricans,” came the roar from the packed waiting room. It was a warm, humid June evening, about eight p.m. Although I’d been a resident for only a few months, my instincts told me this would be one of those nights when the emergency room would earn its moniker as Bedlam’s Door, a revolving carousel of psychosis, with one disturbed person after another being steered to the facility by the police, family members, or friends. “King of the Puerto Ricans,” bellowed the man, his voice reverberating through the corridor. The claim was utterly absurd—from his self-proclaimed royalty to his non-Hispanic accent. It was bizarre, even for the environs of Manhattan Hospital’s emergency room. Another leonine roar of Slavic-sounding speech brought me to my feet. Peering into the reception area, I saw a burly man bound securely to the confines of a high-backed wooden wheelchair. Despite his raging, the man—appearing to be in his sixties—had a cherubic-looking face, with round, rosy cheeks and bushy, dark eyebrows. A huge mane of white hair crowned his head. Highly agitated, he struggled against the canvas straps binding him to the wheelchair. Though his ankles were secured to the contraption’s front rigging, he managed to kick and stomp his feet on the footrest. “Let me go. I have work to do,” he roared. His words were barely comprehensible, partly due to his agitation, but also because he lapsed into a foreign language—perhaps Polish, or some other Slavic-sounding tongue. He shook the wheelchair violently, attempting to break free. A woman wearing a drab housedress tried to quiet him, but he kept shouting. A police officer I knew saw me and approached. “What’s up, Officer Romano?” I asked. “He was running down Delancey Street, tossing trash baskets and shouting. We couldn’t control him. He’s as strong as an ox. You hear what he’s yelling?” Romano shook his head. Over the years, he’d brought his share of patients to our doors, but this one clearly perplexed him. That week I’d already encountered the putative son of God, an enraged Moses, and Satan himself. But I never imagined meeting the king of the Puerto Ricans. “Who’s the woman?” I asked. “Any previous history you know of?” I asked. A carpenter? Why doesn’t he think he’s Jesus? He knew I’d sent the police packing scores of times with drunken and disorderly miscreants they dragged to the emergency room, trying to avoid tossing them into the precinct’s drying-out tank. The cops hated babysitting drunks almost as much as they loathed the paperwork involved. But Nathan B. was a man lost in the throes of madness. Sarah B.’s pale face sagged. Her gray hair was tied back in a bun. She dabbed at her reddened eyes with a handkerchief. In the housedress, she looked like a Russian or Polish peasant woman from a bygone era. “He seemed so sad, so depressed,” she said, brushing away a tear. “Did he ever have an episode like this before?” I asked, wondering if Nathan B. might be suffering from bipolar disorder. “No. Never. But after he got hurt, he began talking to himself—strange words. And then came dreams, terrible dreams. He would cry out in his sleep. And when he woke up, he would shake and be covered in sweat. He was so wet, I had to change the sheets. He would pace all night, like a wild beast. And talking to himself—under his breath, in Hungarian. I tell you, Doctor, we never talk in that language . . . only English. “What happened?” I asked, fairly certain of the events to which she was referring. “The Nazis,” she murmured, as her hands went to her face and she sobbed. When Nathan was wheeled into the office, his eyes bulged and his face shone with sweat. His shirt was soaked with perspiration. He was restless and his eyes darted from the walls to the ceiling. No response. He seemed lost in some inner world. He wore work pants, heavy boots, and a short-sleeved work shirt. His chest was broad and powerful-looking. His hands, large and roughly calloused, were those of a man who’d done carpentry all his life. His forearms, strapped to the wheelchair’s armrests, looked as though cables were bundled within them. A series of blue-black numbers was tattooed on his left forearm—a remnant of Auschwitz. “How can you do this?” he growled. Suddenly, his eyes crawled over me. Spittle formed at the corners of his mouth. “How dare you tie up a king!” he shouted hoarsely. “God made me king. Do you question his word?” His chin quivered. He trembled so intensely, the wheelchair shook. “Such a poor people . . . and persecuted. They must go to their own land.” His eyes roamed about the office once again. “What is this place?” he demanded. His eyeballs rolled upward and he fixed his stare at the ceiling. He began muttering a goulash of English, German, and Hungarian. Nathan B.’s mane of white hair, coupled with his upward gaze, reminded me of Renaissance paintings depicting ancient prophets—maybe something by Caravaggio—painted in dusky colors with ethereal light radiating from some godly presence. His garbled muttering continued. He was lost in a world of messianic revelation. The extent to which deluded thinking could seize a person never failed to amaze me. I tried again to get him to talk. “I’m king of the Puerto Ricans” was all he would say in English. “Mr. B., I’m going to admit you to the hospital,” I finally said. I’d tapped into his past—and the source of his madness. “King of the Puerto Ricans,” excerpted from Bedlam’s Door: True Tales of Madness and Hope by Mark Rubinstein, MD (Thunder Lake Press). © Mark Rubinstein. You can read an interview with the author here.